Vimal introduces the ancient Japanese anti-ageing secret – ‘Rice Bran Oil’, the first cooking oil which helps you stay healthy & young. 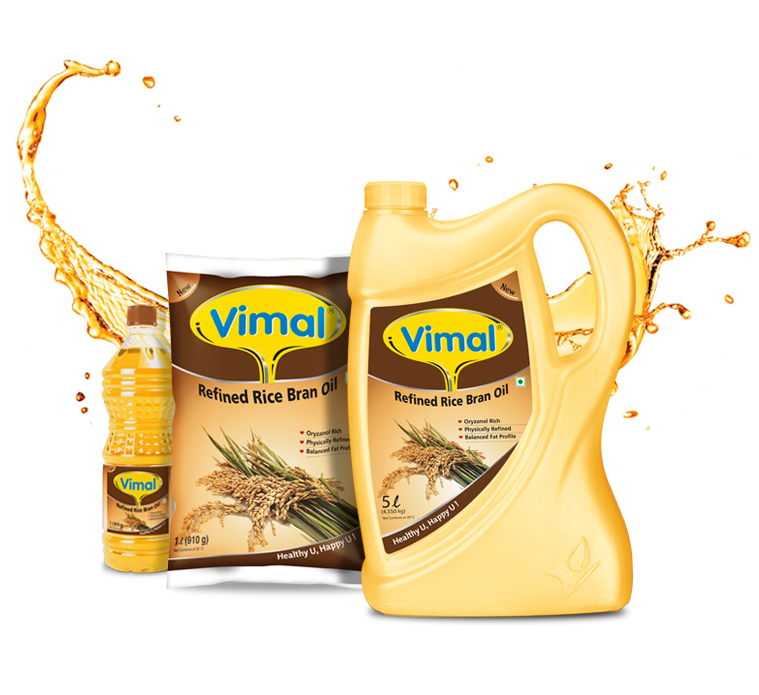 Vimal Rice Bran Oil is nutritious physically refined Rice Bran Oil produced from oily layer of brown rice, which is separated in the form of Rice Bran while producing white rice.Vimal Rice Bran Oil is the richest source of natural Oryzanol, the nutrient found only in Rice Bran Oil.Vimal Rice Bran Oil is also rich in Tocopherol, Tocotrienols, Phytosterols and Squalene apart from having balanced PUFA - MUFA ratio which makes Vimal Rice Bran Oil the healthiest cooking oil for your family. RICE BRAN OIL 24 34 42 Tocopherols, Tocotrinols, Oryzanol Most ideal fat composition, rich in unique nutracentical & anti-oxidants. Question : Whether use of edible oils is essential? Answer : Yes, The use of edible oils is essential & integral part of healthy balanced diet. It gives us maximum energy, helps to absorb fat soluble vitamins, produces hormones and maintains healthy skin, along with many other vital functions. But one has to be very particular about its, quantity and quality. Question : What quantity of oil should a person consume daily? Answer : According to guidelines issued by the National Institute of Nutrition, Hyderabad (a premier Nutrition Research Institute of ICMR, Government of India) every person should consume 20 to 30 grams of edible oil/fat per day . It can increase or decrease depending upon physical activity & physiological status. Question : Which edible oil should be used? Answer : Edible oils containing high levels of Poly-Unsaturated Fatty Acids (PUFA) such as Safflower Oil (Kardi Oil), Sunflower Oil, Cottonseed Oil, Soyabean Oil & Corn Oil are no longer advised to be used as a sole cooking medium. Sole and prolonged use of these oils has been found to adversely affect the levels of “Good Cholesterols” besides causing many other health complications such as Rheumatoid Arthritis, Parkinson’s Disease & many other degenerative diseases.National and International dietary advisory bodies now suggests the use of edible oils which ensure almost balanced intake of all the three types of fats with moderate levels of Saturated Fatty Acids (SFA), Poly-unsaturated Fatty Acids (PUFA) & higher levels of Mono-unsaturated Fatty Acids (MUFA). Question : Is there any edible oil, which matches the latest recommendations as a sole cooking medium? Answer : Rice Bran Oil is the closest to the latest dietary fat recommendations as a sole cooking medium. Question : Why Rice Bran Oil is considered better than other edible oils? Answer : Rice Bran Oil is the only edible oil with naturally balanced fat composition & added advantage of unique nutraceuticals Oryzanol & Tocotrienols, which are known to ensure right balance of good & bad cholesterols & many other health benefits. Question : How to use Rice Bran Oil to perfectly match the new recommendations? Answer : Every person should consume about 1 Liter (910 gram) of Rice Bran Oil per month. It is also advisable to use about 5 gram (one tea spoon) of grinded flax seeds (Alsi beej) daily to meet requirements of Omega3 intake. These can be consumed with a cup of milk or curd. Question : Whether Rice Bran Oil can be used by diabetic patients? Answer : Yes, Rice Bran Oil is useful for diabetic patients as it is known to improve insulin sensitivity. Moreover, diabetic persons are more prone to coronary heart disease, and maintaining the right balance of the cholesterols is more important for them. Rice Bran Oil, with its better cholesterol balancing properties than other edible oils, is definitely the better choice for them. Question : Whether Rice Bran Oil can also be used by a person with Blood Pressure & Heart Disease? Answer : As per researches done on Rice Bran Oil, this oil helps in increasing Good Cholesterol (HDL) & at the same time reduces Bad Cholesterol (LDL, VLDL, Triglyceride). So, Rice Bran Oil can be a good oil for person suffering from Blood Pressure, Coronary Artery Disease & Heart Diseases. Question : Some persons are known to have excess gas formation/bloating by consuming Rice. Whether such persons can use Rice Bran Oil? 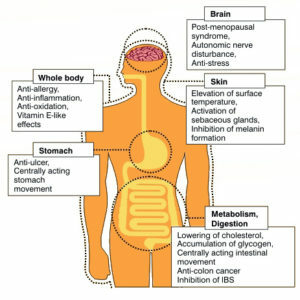 Answer : Carbohydrates present in rice may cause problem of excess gas formation/bloating in some persons. But Rice Bran Oil does not contain any carbohydrates. Rather “Oryzanol”, which is a unique micro nutrient present in this oil, is known to be helpful in guarding against such problem. Question : Some edible oils tend to become viscous (Thick) during acute winters. Is it something to do with its quality? Answer : Edible oils which do not contain desired levels of saturated fat (solid fat), as per the latest recommendations, do not become viscous/thick during acute winters. But edible oils containing desired levels of saturated fat such as Rice Bran Oil are bound to become viscous during acute winters, which is a proof of its having required balanced fat composition. Question : Is there any link between colour & quality of an edible oil? Answer : Most of the edible oils found in the market are refined through the conventional process of chemical refining. Alkali (Caustic) & Acids used in this process, no doubt makes the colour of the oil much lighter, but it also destroys most health beneficial nutrients. So always prefer Rice Bran Oil refined through the latest process of Physical Refining without using Alkali (Caustic), having golden-yellow colour. It is rich in natural anti-oxidants & unique micro-nutrients which are known to maintain healthy cholesterol levels, besides promoting overall health. More than four times as effective at stopping tissue oxidation as vitamin E.